After a century of waiting, China’s East Lisu people finally have the entire Bible in their heart language. China’s East Lisu people are farmers by trade, but you wouldn’t know it by their soil. Forced off their fertile farmland by more powerful tribes, the East Lisu people eke out a living on the hard, stony mountainsides of Yunnan Province—a rural territory in southwest China. In the dry mountain air, they can grow little more than potatoes, corn and yams. But in October 2016, the East Lisu people reaped a harvest beyond their wildest dreams. A century after their ancestors first converted to Christianity, China’s East Lisu people received the complete Bible in their language for the very first time. This spiritual harvest sprung from the labors of the East Lisu people themselves. 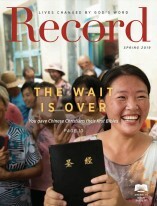 With training and support from United Bible Societies China Partnership and American Bible Society’s generous financial partners, a humble group of believers translated the entire Bible for their people. Through their sacrificial labor, God’s Word is now taking root in this remote mountain community. The newly published Bible started out as the dream of a schoolteacher named Yang Hanquan, who began translating the Scriptures into East Lisu nearly forty years ago. In fact, Yang and his friends produced a rough draft of the entire Bible. But without means to have the Bible reviewed, printed and distributed, his people remained cut off from the power of God’s Word. That’s when United Bible Societies stepped in. From 2005 to 2016, a translation review team, comprised of five East Lisu farmers, made Yang’s dream a reality. With guidance from a United Bible Societies translation consultant, the team edited Yang’s Bible—all 30,000 verses. “They wanted us to check every single verse,” says United Bible Societies Translation Consultant Simon Wong, who led the review team. Wong says the East Lisu reviewers were sticklers for accuracy; if they were going to translate God’s Word for their people, they were going to do it right. “Even when I wanted to reasonably speed up, they rejected it!” Wong says. While the native reviewers brought their enthusiasm to the table, Wong brought his expertise. On behalf of United Bible Societies, he trained the East Lisu farmers in the principles of Scripture translation. During their work on the Old Testament, he also taught the team to use ParaTExt—a world class Bible translation software. Until then, they had only used Microsoft Word. The team’s diligence extended well beyond the translation work itself. During the project, the East Lisu review team traveled six hours between their village of Taogu and translation sites in Kunming and Wuding. Away from home for long stretches of time, they had to hire laborers to do their farming for them. Now their sacrifice is finally paying off. On a sweltering hot day in late October, the East Lisu people donned their celebratory costumes—a dazzling neon rainbow—for the public launch of the East Lisu Bible. Packed like sardines into the courtyard of a church, East Lisu believers clutched the full Bible in their outstretched hands for the very first time. A team from American Bible Society attended the monumental celebration in Yunnan Province. “They were crying,” says Senior Vice President Laura Dabkowski. 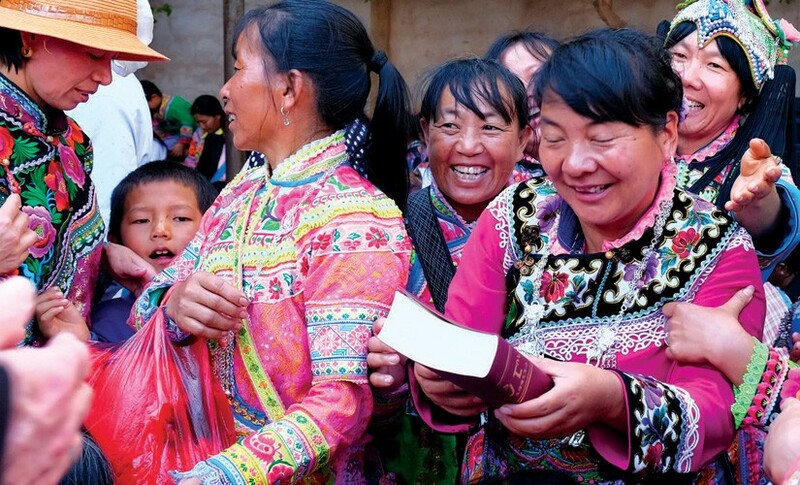 “There were huge smiles as I was handing out Bibles.” Given how long the East Lisu people had waited to hold God’s Word in their hands, their emotional response was hardly surprising. “Imagine living in a village that’s been Christian for 100 years, but never having a Bible of your own,” says Cheryl Holland, who serves on American Bible Society’s Board of Trustees. The East Lisu believers also responded to a special message from American Bible Society President & CEO Roy Peterson. When Peterson said this, the crowd of East Lisu believers gasped out loud. They couldn’t believe that, out of the world’s 7,000 language groups, God had chosen to bring his Word to them. “One of ‘the least of these’ has become one of the most blessed,” Peterson says. And as the East Lisu community dives deeper into God’s Word, these blessings are multiplying. With support from United Bible Societies China Partnership, the East Lisu translation team is now teaching their neighbors how to read the Bible through Scripture literacy classes. In addition to the Scripture literacy classes, the East Lisu people need trained pastors who can accurately teach them God’s Word. By equipping Bible schools in China with Scripture tools and resources, American Bible Society’s financial partners are helping train new pastors in China. According to the national average ratio, there is currently only one ordained pastor for every 6,700 Chinese believers. But the demand for more pastors in China is a good problem to have, as they say. The spiritual harvest is simply so abundant that it’s difficult to keep up. While this exponential spiritual growth in China is astounding, its cause is no secret. As the East Lisu people in rural Yunnan Province will discover for generations to come, amazing things happen when people encounter the love of Christ in the language of their hearts—whether in the pew of a church or out in the rocky fields they call home.